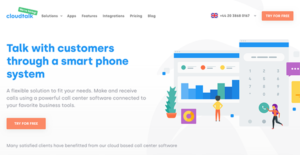 CloudTalk is an intuitive cloud-based call center software designed to enable businesses and organizations to deliver clear, responsive, and high-quality customer support to their clients. It is an extremely flexible communication platform that can be tailored to suit any environment, business size, and even specific needs and requirements. Aside from customer support, CloudTalk can be implemented as a virtual phone system and business contact center as well. The only thing CloudTalk needs is a stable internet connection for it to work. It doesn’t require users to purchase and set up additional hardware or install any software into their system. Maintenance is a breeze as well. CloudTalk seamlessly links with a wide selection of business tools including CRMs, e-commerce, ERPs, chat software, and more, incredibly extending its functionality and making it easy for any business to communicate with their clients, potential customers, and even within their organization. CloudTalk simplifies customer support management. It is so powerful that it can handle complex processing of inbound phone calls, thanks to its myriad of essential and advanced features including VoIP phone calls, caller groups, advanced and intelligent call routing, and IVR menu among others. All these capabilities help shorten the customer support process and accelerate the delivery of the solution. The software greatly minimizes waiting times and reduces the instances of missed calls, dropped calls, and callbacks. Thus, it all results in customers becoming extremely satisfied and drive business growth further. When you see all the information about your operations, performance, agent status, and more, managing your call center is a breeze. With CloudTalk, you have immediate access to every aspect of your call center operations, all thanks to its very complete and transparent interface. You can also configure CloudTalk’s functionalities so that the software easily adapts to your existing setup, current workflows, as well as your needs and preferences. All your call center’s statistics and performance analyses are delivered in complete and easy-to-digest graphs, allowing for a fast understanding of all your information. This helps you make quick and smart decisions that are founded on relevant data. No guesswork or intelligent estimates. Your agents will surely love how CloudTalk automatically displays real-time customer cards during calls. Useful information including customer name, phone number, previous conversations, notes, and more are instantly within reach. This helps your agents save time as they no longer have to search the database for relevant and useful data. Simply put, they can personalize their customer service and provide resolutions to any query or issue. Customers will love the entire experience as well. What Problems Will CloudTalk Solve? 1) Improving e-commerce customer support – Through integrations with ticketing systems and e-commerce platforms you can achieve better and more personal support of your clients. All the necessary information about orders and previous communication you can see in one place. 2) Improving sales – With CloudTalk’s power dialer and predictive dialer features you can improve the effectiveness of your sales team. You can create custom surveys, call scripts and campaign, track the success of your team and interest of your customers. 3) Local presence for a company with agents all over the world – CloudTalk can provide you with international numbers from more than 70 countries of the world and you can operate our service from anywhere in the world. The only thing you need is a stable internet connection. Calls from the all over the world you can easily and efficiently route to the correct operator. Since each company has particular business requirements, it is prudent for them to desist from looking for a one-size-fits-all ideal software system. Needless to say, it would be pointless to try to find such an app even among widely used software solutions. The intelligent thing to do would be to list the various essential factors that need consideration such as main features, finances, skill levels of staff members, company size etc. Then, you should do your research thoroughly. Read some CloudTalk reviews and check out each of the other solutions in your shortlist in detail. Such in-depth research can make sure you weed out ill-fitting platforms and choose the app that presents all the elements you need for business success. How Much Does CloudTalk Cost? We realize that when you make a decision to buy VoIP Software it’s important not only to see how experts evaluate it in their reviews, but also to find out if the real people and companies that buy it are actually satisfied with the product. That’s why we’ve created our behavior-based Customer Satisfaction Algorithm™ that gathers customer reviews, comments and CloudTalk reviews across a wide range of social media sites. The data is then presented in an easy to digest form showing how many people had positive and negative experience with CloudTalk. With that information at hand you should be equipped to make an informed buying decision that you won’t regret. Smart tool for smart teams & Excellent customer experience. What are CloudTalk pricing details? What integrations are available for CloudTalk? Pros: Features like real-time customer card, preferred agent, advanced routing based on caller-id or agents skills are the best. Helped us provide personalized support and improve customer satisfaction. Cloudtalk support team also provide awesome support. Cons: Reporting isn't as powerful as I expected. I'd like to see more predictive analytics and suggestions. Pros: The best on Cloudtalk is the ability to integrate with other tools you use. So, when a customer reaches out us I am able to see all of their account information right in Cloudtalk. Cons: There are no cons at this moment, does everything as we expected. If you need more information about CloudTalk or you simply have a question let us know what you need and we’ll forward your request directly to the vendor.